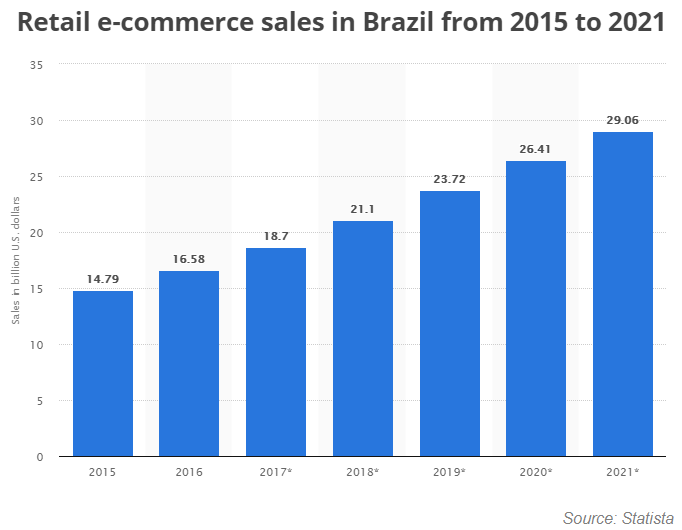 The e-commerce industry in Brazil (EWZ) (BRAQ) (BRZU) ranks 10th in the world in size. 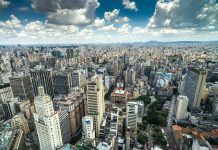 With a population over 200 million, a large consumer base comprised of an outsized share of millennials, and rising median household incomes, this Latin American (ILF) economy offers the perfect playing field for e-commerce businesses. US-based e-commerce platform Amazon (AMZN), the world’s leaders in online retail sales, first set foot in Brazil five years ago. However, its product offering never extended beyond books. This is about to change though. 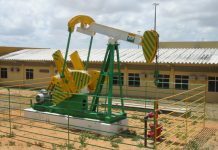 The company is now looking to expand its offerings in the country, which until now had been delayed on account of high taxes and infrastructural setbacks in Brazil. 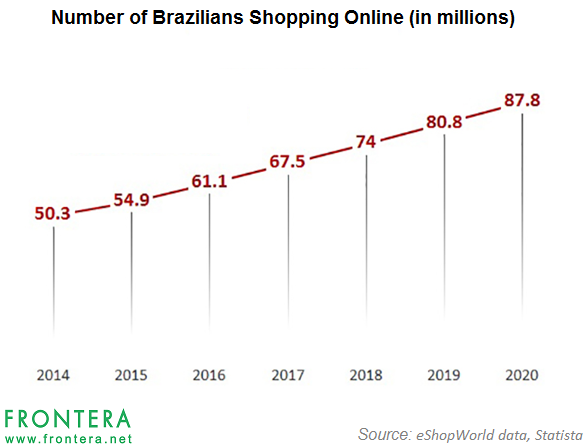 Over 61 million Brazilians currently shop online, and this figure is forecasted to reach 87.8 million by 2020 (chart above). 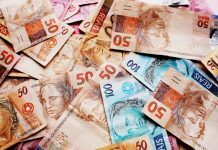 Retail e-commerce sales in Brazil amounted to $16.58 billion in 2016, and this figure is expected to at least double by 2021. An interesting point here is that about 49% of digital buyers in Brazil made cross-border purchases in 2016, according to PFSweb, Inc. 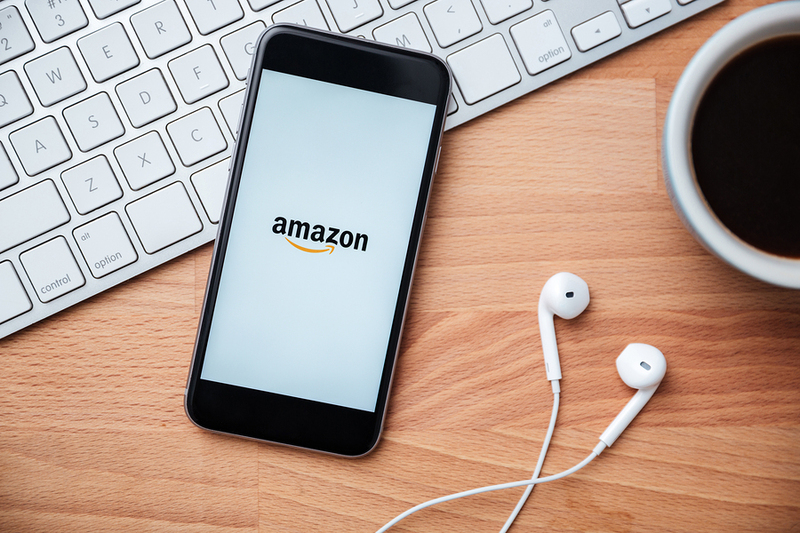 This helps build the case for multinational e-commerce players such as Amazon (AMZN), which are already positioning themselves to tap into this opportunity. Amazon.com is listed on the NASDAQ GS stock market under the ticker AMZN. The stock is up 29.68% YTD (as of October 26) and boasts a $468.6 billion market capitalization. In financial year 2016, the company reported an ROIC of 7.25%, operated with an EBITDA margin of 9.05%, and a gross margin of 35.09%. EPS growth rate for the company was reported at 290.7%. The company earned a whopping $136 billion in global retail website revenues in 2016. So, before the mammoth retailer commits to a much-anticipated expansion in Brazil, it is worthwhile to take a quick look at its 3 biggest competitors already cashing in on the Brazil’s massive online consumer base. MercadoLibre Inc. (MercadoLivre in Portuguese) is Latin America’s leading e-commerce technology company. The website allows businesses and individuals to list items and conduct sales and purchases online in either a fixed-price or auction format. Listed on the NASDAQ GS stock market under the ticker MELI, MercadoLibre commands a market capitalization of $10.1 billion and is up 46.7% YTD (as of October 26). The stock currently trades at a P/E of 61.01. Forward P/E (as of 12/17) for MELI is estimated at 84.6. Analysts who reviewed the stock from a buying perspective have rated the stock 3.59/5, comprising 35.3% BUY, 58.8% HOLD, and 5.9% SELL recommendations. For the 2016 financial year, the company reported an ROIC of 18.72% and operated with an EBITDA margin of 24.88%, and a gross margin of 63.58%. EPS growth rate for the company was reported at 18.9%. The company earned $455 million in revenues from its marketplace business in Brazil in 2016. B2W Companhia Digital engages in the e-commerce business through a digital platform in Brazil. The company offers through its website, products including books, CDs, DVDs, IT equipment, electronic equipment, perfumes, and clothing. Listed on the Brazilian stock market under the ticker BTOW3, the stock commands a market capitalization of $3.1 billion and is up 126.2% YTD (as of October 26). The company’s US-listed ADR, BZWHF is up 151.7% YTD (as of October 26). For the financial year 2016, the company reported an ROIC of 3.48% and operated with an EBITDA margin of 7.6%, and a gross margin of 19.91%. EPS growth rate for the company was reported at 16.6%. The company earned $2.5 billion in revenues from its e-commerce business in 2016. Analysts who reviewed the stock from a buying perspective have rated the stock 3.13/5, with 25% BUY, 56.3% HOLD, and 18.8% SELL recommendations. Magazine Luiza S/A operates a multichannel retail platform of mobile, website, and physical stores. The company offers e-commerce services and retails a wide range of electronics, toys, power tools, and houseware products. Magazine Luiza develops big data, machine learning, and other technologies to remove friction from the retail process. Listed on the Brazilian stock market under the ticker MGLU3, the stock commands a market capitalization of $3.8 billion and is up 395% YTD (as of October 26). The stock currently trades at a P/E of 54.91. Forward P/E (as of 12/17) for MELI is estimated at 34.66. For the financial year 2016, the company reported an ROIC of 17.02% and operated with an EBITDA margin of 7.13%, and a gross margin of 30.74%. The company earned $2.7 billion in revenues from its retail business in 2016. Analysts who reviewed the stock from a buying perspective have rated it 4.43/5, with 71.4% BUY, and 28.6% HOLD recommendations.